For the 1970 film, see Mumsy, Nanny, Sonny and Girly. Girly is a webcomic created by Josh Lesnick which generally centers on the romantic relationship between two girls named Otra and Winter, as well as other citizens of the city of Cute-Town. It ran from April 2003 and finished on September 16, 2010. On October 15, 2005 Girly became a part of the Dayfree Press collective, and on June 28, 2006 the first Girly print collection was published via Radio Comix. 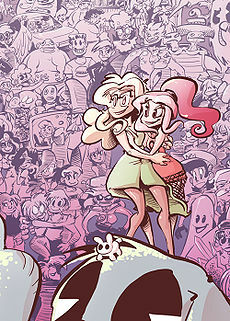 The webcomic serves as a sequel to Lesnick's previous work, Cutewendy. It tells the tale of Otra, a fashion designer who feels something missing in her life until she meets Winter, the daughter of Wendy and Other Girl from Cutewendy, who declares Otra her sidekick. After a few adventures, Otra becomes attracted to Winter and the two become a couple going on adventures together. Girly launched in April 2003, originally intended as a sequel/retelling of one of Lesnick's previous works called CuteWendy, and originally was not intended to run for more than 50 strips. However, Lesnick became enamored with the characters, with the comic reaching 764 pages by its end. Lesnick originally hosted Girly on KeenSpot. In November 2004, he moved Girly over to his own server, where it has remained since. On October 15, 2005, Girly became part of the Dayfree Press collective of webcomics which includes such other strips as Dinosaur Comics and Questionable Content. On August 23, 2006, Lesnick announced that fundraising efforts for the comic had been successful that he would attempt to support himself wholly via the comic. On June 28, 2006, the very first print collection of Girly strips was co-published by Radio Comix and Josh's own company Studio Zoe, and was made available via Amazon.com and selected comic stores. On May 2, 2007, volume 2 became available. Book collections were put on hold following this volume, until after the comic ended, when, after a successful Kickstarter campaign , a limited run boxset of the complete series was made available and offered exclusively online. The final chapter was posted on September 16, 2010. Girly's style is line-based and monochrome, using a vertical format. The original style of line drawing is akin to a manga-style but with more abstractions, giving it a sketched, freehand sort of look. The line art has evolved a great deal as time has passed, and no longer bears a great resemblance to most manga, however; recent works are somewhat reminiscent of some of John Kricfalusi's work. The art of the strip has shown a steady trend away from thin, pencil-like lines towards a much more variable, ink-brush look. After a short hiatus, on August 4, 2007, in Girly #504, the art of the strip transitioned to a much more prominent use of color. Along with absurdity and playing with stereotypes, Girly has a strong vein of sexual humor. Various overhead shots show that Cute-Town has a skyline very similar to Dallas, Texas. In comic #398, the Alt Text to the comic said the author took the skyline of Dallas, and added smiley faces and a kitten. However, the interior of Cute-Town is said by the author to resemble Austin, Texas. Girly revolves around the main characters Otra and Winter (and often the cat as well). Occasionally the story will move to a small sub-story centered around one of the secondary characters but will eventually be tied back into one of the main characters again. Otra - Otra is the main character of Girly. She is 26 years old  and is currently self-employed as a freelance fashion designer for the company Guapa. Not much is known about Otra (her name wasn't fully revealed until well into the comic) except that she hasn't had too hard of a life; she's just constantly disappointed/sad about mostly everything. Her main hobby is roaming through the city and observing life. Before she met Winter, she would deal with the annoying people in her life by cramming them into or tying them to small rockets and launching them into space. Winter's sudden appearance in her life has changed her a little day by day. Otra first appeared in Strip 1. Her name is Spanish for "other one" - a reference to CuteWendy's sidekick, known only as the Other Girl. Winter - Winter is Otra's girlfriend. She is 19 years old, has no job or home and has declared Otra to be her sidekick early in the comic. She has since looked out for Otra devotedly, helping her with work and even occasionally saving her life as well. Not much is known about Winter except that she is the daughter of CuteWendy and her sidekick Other Girl from Girly's predecessor CuteWendy (as revealed early on). She's free-spirited, with an attitude that's both serious and yet silly. First appeared in Strip 1. Marshmallow Kitty - A cat that was originally homeless and wandered the downtown area living off scraps and donations of food. After meeting Winter and Otra, it took a liking to them and followed Otra home. It soon became Otra's cat. Although the cat was intended to stay a secondary character or mascot, it became a primary character through its popularity. Its early appearances made it appear slightly perverted, but that has since stopped. The cat is too pudgy to roll itself over when it's on its back, and is totally indestructible. Recently it has given birth to several kittens, much to Winter and Otra's distress, and is now officially designated as female. In Strip 504 it was shown that Marshmallow Kitty was part of a scientific project to create the world's greatest cat, however this experiment resulted in the destruction of the laboratory along with everyone inside of it excluding Marshmallow Kitty. First appeared in Strip 36. Girly previously had two volumes of books released, encompassing the first 7 chapters of the story, as well as two editions of a complete collection of its Cutewendy prequel. A complete collection of the series was published in the Summer of 2011, after being funded by Kickstarter. ^ joshl (2006-08-26). "Another webcomic (Girly) reaches a $$$ goal]". Comixpedia. Archived from the original on 2012-02-04. ^ "Girly Volume 1, Amazon.com". Retrieved 18 May 2012. ^ "Girly: The Complete Collection by Josh Lesnick". Retrieved 20 March 2011. ^ a b "The Girly Store". Retrieved March 13, 2007. ^ Overhead view of Cute-Town resembling Dallas, Texas Archived 2006-11-07 at the Wayback Machine. ^ Girly #577: Otra's current age is given in the Alt-text. ^ Girly #576: Winter gives her age. This page was last edited on 21 April 2019, at 08:27 (UTC).